As suspected, (half of) the Eglu arrived today. 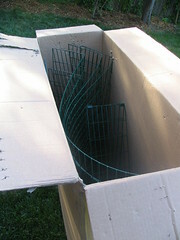 More specifically, the Run part of the Eglu arrived in a somewhat-intact box. 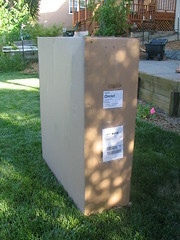 What's not visible in the photo on the right is the fact that the bottom of the box was hanging together by only 4 of the eight staples that were smartly added to insure it held together in transit. the bottom of the box was littered with what seemed to be the remains of a bunch of styrofoam popcorn. Of all the outfits I'd imagine would be using more environmentally-friendly packing materials, I'd have thought it'd be the Omlet folks. Maybe when the rest of the Eglu arrives (tomorrow?) I'll get to see how the not-so-light-and-airy pieces are packed together. As I understand it, I'll be getting the Eglu house, the run cover, the food/water bowls and instructions how to put it all together in the next box. Per DHL, it's due to arrive tomorrow. I (and the girls) can't wait!